Jeremy Zucker is an up and coming indie pop artist and producer, who became gained recognition as a member of the band 3OAK. He recently released his first EP on May 4th, 2018, titled glisten. The song “All The Kids Are Depressed” is off that EP, and is a song that attempts to come grips with the reality that the majority of people do have depression, and that the kids of today seem to be the first generation to actually be having constructive dialogue about mental health. This song is an ode to them, and the idea that we all have issues that require help on a daily basis. 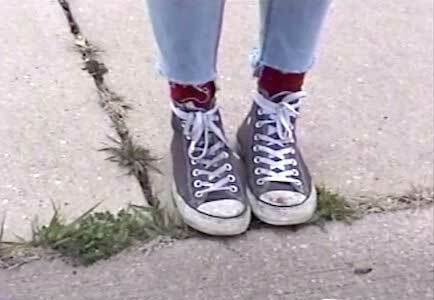 A girl wears gray high top chucks in this video. The actual song is hard to describe, kind of like depression. It at times feels happy and upbeat, and at others feels slow and solemn. This dynamic actually simulates the feeling of depression very well, showcasing that there are ups and downs, not just constant sorrow as many depictions of depression would have you believe. Zucker’s vocals are empathetic and really offer a great depth of emotion, on top of meshing well with the song’s melody and tone. This girl’s dad died when she was young and it has stuck with her in the form of depression ever since. The music video is shot in the style of a short film, using a mixture of high quality footage and grainy home video style footage to tell the stories of those that are battling with depression. Zucker starts the video off by standing alone in the street as he says that when he put the casting call for this video asking people to share their battles with depression, he didn’t know what to expect. He says he received hundreds of emails and messages sharing the most intimate and personal details about the struggles these people have gone through. The video then proceeds to share some of these stories through subtitles at the bottom of the screen while the song audio plays. Each story is as different as the people telling them, but they all share the story of the constant battle they have to fight against depression. One girl tells of how her dad died on September 11th, when she was only 5 years old, and that after her mom remarried she lost all trust in her. She and some of the other people in this video wear chucks, but their stories are the real takeaway from this video. They are the rightful focus and are all equally important in showing others that, may have depression that it is possible to live a life that is full of joy and happiness. It’s always important to have others you can lean on when you have depression. Don't be depressed. Cheer yourself up by using the links below to get new pair of chucks.